Remember that one crush that you told yourself you’d never have? Maybe it was that bestie that you totally thought it might work with, but it never got to that specific point of togetherness…but we will never forget that first crush! Kiss Cam by Kiara London has all of the butterflies of a first crush and it’s an unforgettable fall treat. In the book, kissing takes center stage, especially kissing between friends. What could go wrong, right? It’s simply harmless fun. Many things, especially when it comes to teen relationships. The novel tells the story of Juniper, Jasper, and Lenny, who have been friends forever and co-own a vlog channel called WereVloggingHere. Their fans are huge "shippers" who believe that Juniper and Jasper are perfect for each other, and, despite warnings from friends and family, a simple Truth-or-Dare inspired kiss soon spirals out of control into a whole new world of making out and surprise kisses. Juniper and Jasper's relationship begins to shift. 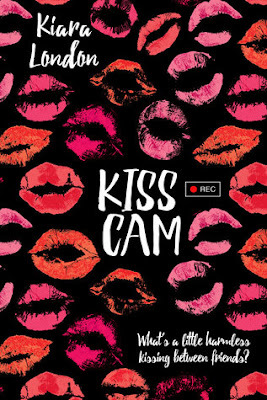 But as fan requests for different "Kiss Cam" segments keep pouring in, Juniper puts her worries aside and convinces herself that it doesn't mean anything, because it’s just a kiss or two, right? Things get serious when feelings come to play, like it could happen in any romance that is still trying to figure things out. I enjoyed reading this novel; though I did find at times that it’s certainly a more juvenile young adult novel meant more for the younger set that is still enduring the first challenges with true love. But, this certainly doesn’t mean I didn’t enjoy it. I found myself transported to high school years, reminiscing about my crush back then and certainly at times rooting for these adorable characters to figure it out once and for all…and it was quite the fun ride to experience! No spoilers here, but make sure to pick this book up if you enjoy teen romance…it’s a sweet as candy treat that will have you hooked from page one and I guarantee you’ll be back in high school from the start to the end…and that can be a fun and exciting way to feel! Just get ready…you might want to call that former crush once you’re done with this super cute novel.